“How come my foot hurts?” That’s the question Christopher McDougall presents to doctors in the start of his book Born to Run. The book is fun read, and every runner should read it. The conclusion by McDougall is that the shoes manufactured over the last 30 years (lots of support, cushioning, raised heels, etc.) 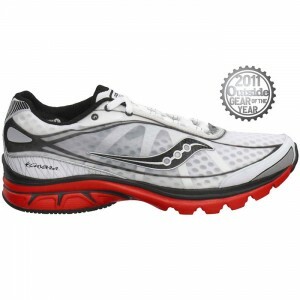 are the cause of most running injuries and that running barefoot or in minimalist shoes is the key to reducing injuries. The book is not what this post is directly about, though. My foot hurts, too, and has for most of the last year.Â Allow me to explain. 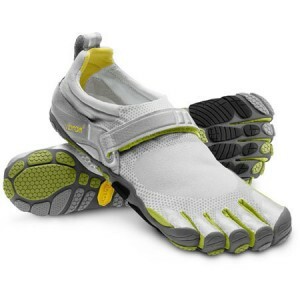 In June of 2010, I bought Born to Run and a pair of Vibram Five Fingers (VFF’s) Bikilas on the same day. I had only been aware of VFF’s for about a week and had just read about improving form and strengthening feet by going barefoot or moving to a minimalist shoe – basically a shoe with very little heel to toe drop and much less cushioning.Â I’m always looking to improve, so this sounded reasonable. I’ll take the magic beans, please. My main shoe up to this point had been the Adidas Sequence 3, a motion control shoe with 12mm of heel to toe drop.Â This is a bit ironic, but I now know I have high arches and really do no pronate much, so I should not have been in a motion control shoe (maybe no one should? Read Born to Run). Â I was actually on my 3rd pair of Sequences at this point in my running, having put over 500 miles on each of the previous pairs of Sequences I used.Â Occasionally, I had a blister or some pain in my left leg, which may have been the IT band, but nothing had sidelined me yet.Â Being the start of summer with no races scheduled, I decided to work on form and reducing my shoes by running in the Five Fingers. Here’s why my foot hurts – too much too soon and high pain tolerance, which allows me to push too far!Â The first time I started experimenting with VFF’s and barefoot running,Â I thought I was taking it easy – per all advice I had read.Â I didn’t run more than a mile at a time in the VFF’s a couple of times a week the first month.Â IÂ gradually increased up to 2 miles max by end of month 2. Â I also ran some barefoot on grass and a bit on the street. I had only put about 25 miles on the VFF’s by end of September, with a longest run of 3 miles, when plantar fasciitis hit me hard in the left foot. More on that in a minute. I should mention that in early August of 2010,Â I started seeing reviews of the Saucony Kinvara and purchased a pair of those to help with the minimalist transition and be my 3-10 mileÂ shoe.Â The Kinvaras have a 4mm heel-toe drop vs. the 0mm in the Bikilas and 12mm Adidas.Â By now (late summer) I was experiencing pain in the bottoms of my feet, but it would pretty much go away during runs.Â I had the usually transition tight calf muscles and sore Achilles tendon, but I was stretching. However, I was not familiar enough with plantar fasciitis at this point to recognize the warning signs of impending doom. I had signed up for the local Dam Run 10K race in mid-September, which starts on the Lake Murray dam and works its way downhill to finish in Saluda Shoals Park.Â It is a scenic run, and I had set my 10K PR there in 2009.Â IÂ remember wondering if I should try it in the Kinvaras, or even at all, given the tender feet.Â About a week before the race, my feet actually seemed to be OK again. I had been running in the Kinvaras 5-6 weeks by this time.Â Â So, I set out to run this 10K in my Kinvaras.Â To wrap up this part of a long story, I injured my left foot during this race. Top of foot pain (TOFP) setÂ in about the 4.5 mile mark due to what I call “coasting” on the downhills.Â This is where I lean with the hill, letting gravity take me downhill, making sure not to brake with my heels on the down slope.Â This particular run was mostly downhill, too.Â Unfortunately, this tactic is hard on your feet, and I was hobbling pretty good immediately after the race. As I mentioned before, there were signs of PF before the Dam Run, with sore feet soles and tight calf muscles.Â After the Dam Run, I took a week off.Â The TOFP was gone later in the week, and the following Saturday, my son and I set out for an 11 mile run.Â We were training for a November half marathon.Â At mile 9, the PF monster decide he’d warned enough.Â It was time to attack.Â Chomp – my heel was on fire, and I could not run.Â I tried to walk/run, but that would not work.Â I had to limp walk the last 2 miles home.Â A trip to the doctor showed no fractures in the foot, but he did confirm my self-diagnosis of plantar fasciitis. I won’t get into the entire PF saga in this post, I’ll save it for another lengthy post. I did recover enough to run the half marathon without pain in November and the Myrtle Beach Marathon (MBM) in February.Â During marathon training and the marathon itself, I had a lot of discomfort under my left pinkie toe/5th metatarsal. A questionable decision of running a 10K the week after the MBM resulted in severe TOFP again.Â An X-ray a month later after the 5th metatasal pain would not go away, showed I had broken the 2nd and 3rd metatarsals somewhere along the way, but they had healed – not perfectly, but not worth surgery either. The doctor believed the weaker foot from these breaks was causing the 5th metatarsal pain I was having. Finally, to the point of this article: Barefoot Running Take 2. The PF battle put my barefoot training on hold last fall. So far this year, I haven’t had heel pain, but I still have a tight and sore bottom of foot every morning and must stretch it out by pressing the bottom of my toes against a fixed object and bending my need forward.Â This stretches the plantar fascia.Â Usually, after this I am good to go.Â The pain in the 5th metatarsal is gone. Running does not hurt and I have continued to run in Kinvaras.Â I also have a new addition to the line up – New Balance MT10 (aka Minimus Trail) trail shoes that have the same 4mm drop as the Kinvara, but significantly less cushioning. 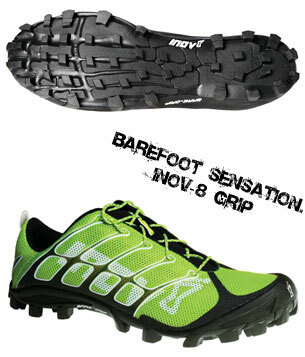 I have put 70+ miles on these since early June, including a 10 and 15 mile trail runs, without any problems. I have started barefoot training again this week (Late July 2011).Â I have a lull here in the summer, where I can afford to experiment and rest before getting ready for a fall half marathon or two, possibly a January Ultra (50K), and a March marathon.Â This week I have had 3 very short barefoot runs, the longest about 400 yards.Â I plan on trying to follow the steps outlined in Jason Robillard’s Barefoot Running book.Â (Click here for a free PDF download of this book). This time around I will run more barefoot.Â Last time, I used the Five Fingers way too much.Â I think with my successes in the Kinvara and MT10’s I am in a much better position to be successful with barefoot running.Â My current goal is to strengthen my feet and get rid of this annoying morning foot soreness, as Christopher McDougall eradicated his foot problem. I would love to get to the point of being able to do 3-4 miles barefoot and use barefoot running as a weekly strength and form building exercise.Â Too early to say if I’d ever run an official race barefooted, but I’d also like to get more miles out of my VFF’s.Â So, maybe I’ll do a late fall 5K in VFF’s.Â I also have in mind using a different shoe than the New Balance MT10’s for my January 50K.Â The trails should be wetter and slicker then, so I would like to go with a shoe with more bite.Â The Innov8 Bare Grip 200 looks interesting, a 0mm drop. Thanks for reading this far! Check back for updates on my barefoot running. -9/25: 3.1 miles in under 30:00!